John Boyega, James McAvoy and Sir Ben Kingsley are among an all-star cast set to provide voices in a new adaptation of Watership Down. The four-part CGI animated mini-series will bring an original interpretation to Richard Adams' classic 1972 novel. It tells the story of a band of rabbits in search of a new home after the destruction of their warren. Commissioned by the BBC, it is the first blockbuster drama made as a co-production between the BBC and Netflix. The series will also feature the vocal talents of Olivia Colman, Nicholas Hoult , Miles Jupp, Freddie Fox, Anne-Marie Duff and Gemma Arterton, and will be written by Bafta-nominated Tom Bidwell. 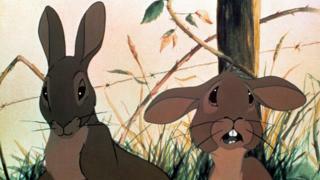 "Before there was Harry Potter, there was Watership Down," said the BBC's drama commissioning editor Matthew Read. "Richard Adams' novel is one of the most successful books of all time and one of the biggest selling books in history. It is fantastic to have the opportunity to bring a modern classic to a mainstream BBC One audience with such an incredible roster of actors alongside the talented team overseeing the animation." The book was first adapted for screen in 1978, and was notoriously frightening for young children, with its adored rabbit characters killed in graphic scenes. This version, the show's executive producer told the Telegraph, "will not just tone down the levels of on-screen violence to make it more appropriate for children, but give a boost to its female characters." The series is due to air on the BBC in 2017, and worldwide, outside of the UK, on Netflix.